[John Victory | Banner] Leslie Perry, graduate student in kinesiology, instructs followers how to use machines while Elad Gunya, graduate student in business administration, records the video for viewers to watch on Snapchat for the day. 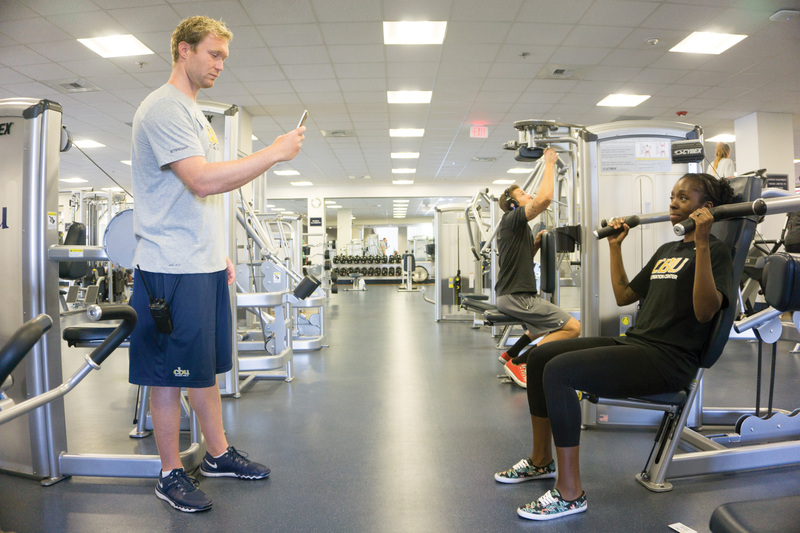 California Baptist University’s Recreation Center is always offering students a way to either maintain or improve their health, even going as far as utilizing social media apps like the popular Snapchat. “Workout of the Day” is something the Recreation Center has started this year in hopes of giving students that kickstart on their health journey and improving their fitness by posting videos on its Snapchat account. Students are able to add the Recreation Center to their friends’ list by taking a picture of the Snapcode posted around campus, if they are interested. “It’s not just for experts that need different things to do, it’s for all levels,” said Zach Long, senior graphic design major. For those who have been to the Recreation Center more than a couple times a semester, the equipment may be familiar to them. For beginners, however, it can be tricky trying to figure out how some of the machinery works, let alone work out on the machine. “People that have no idea how to work out, we explain how to use the machine or the equipment that is being used throughout the workout,” Long said. According to Long, the videos are posted Monday through Friday and will typically go up between the hours of 10 a.m.-2 p.m. Throughout the week, each day will consist of a different trainer who will be focusing on different techniques and muscles. “Some people (work out) different muscle groups on different days, and each workout is going to be targeting a different muscle,” Long said. Leslie Perry, graduate student in kinesiology and personal trainer for the Recreation Center, will be one of the trainers featured in the videos throughout the week. Depending on a student’s health and fitness goals, there is a video for nearly every case. Long said there are videos devoted to weight loss and others targeting muscle gain, with each one giving specific repetitions and weights. For more updates and information regarding the Recreation Center, follow their Instagram and Snapchat — @cbureccenter for both — and look for events and activities coming up in the future.